If you move your carcass into a big pot of water with a touch of salt, some peppercorns, a couple bay leaves, carrots, garlic, and celery, you get a pretty nice stock. If you strain that stock, then put it back in with fresh carrots, some sweet onions, egg noodles, and turkey meat, soup is on. Ah, yes, the big feast. If you’re a Fox Trot fan, you’ll know that Peter’s yearly ritual is to starve himself the day before so he’ll have more room for all the goodies on Thanksgiving itself. I confess that I neglected to eat Thursday while all the prep was going on – but I did weigh in today at a whopping 108, so all this food has been put to good use. Little Boy was on the smoker, doing well. …then gave them a bath in water, beer, and Old Bay. …and The Boy assembled Mom’s pie dough and my apples. I finished off the crab-stuffed mushrooms – this is prior to each cap being covered in a round of provolone. Fat Man was ready for his closeup. Little Boy was resting after a grueling day on the smoker. And in general, just had food for an army of 20 or so. That evening, after pushing food on everyone as they left, breaking down the tables, cleaning up the kitchen, and packing up what food was left, it was time to relax, belly full, in front of a roaring fire. It was a grand day. If you’re reading this and you weren’t here…why weren’t you here? If there is but one indisputable fact about Thanksgiving, it is this: there is no guesswork involved in what you’ll be eating the day after, the second day after, and possibly even the third day after the feast. Our work for the gathering began on Monday, with the hunting and gathering portion of our show. My mom and sister went off to Costco and Publix, bringing home all the assorted puzzle pieces that would make up our meal. Tuesday and Wednesday were reserved for getting some things done in advance of the horde descending on the house. There’s nothing like receiving a really, really long email inquiring about very, very common uses for a server that don’t contravene any of our terms of service. I suppose an answer of “All of those things will be fine” is not appropriate when they wrote 946(!) words. Ah, support, thy name is futility. I sincerely hope I’m not the only one in this world who couldn’t care less about the nuptials of Tom and Katie. It seems to be the only thing plastered all over the news (besides the Michigan – Ohio State game). Anyway, patience. Ever since beginning treatment for cancer, that’s what everyone counseled. Be patient, you’ll get your speech back. Be patient, you’ll get back to eating. Be patient, you’ll get back to eating normally. Be patient, you’ll get your range of motion and strength back. I’m not the patient sort with myself, as anyone who knows me could say. And being patient is making me tired and crazy. So is having my eyes glaze over from looking at properties. I stepped out the front door the other day, as the tow truck was bringing my sister’s car back to the house. It has been raining a bit, and was still sprinkling, but directly in front of the house was a huge, perfect and vibrant rainbow, with a smaller rainbow shadowing it. Fall has arrived, sort of. At least the trees seem to know something that may not be entirely apparent to the rest of us. But what have I been doing? Working a lot after firing some support people. Tending my garden. Not cooking much, although we are having Thanksgiving dinner here and there will be a pack coming in – the menu will be a traditional roasted turkey, a honey-brined, smoked turkey, ham, beans, mashed potatoes, gravy, corn, stuffing, yams, pies, and all sorts of other things. The cranberry-apple compote is already made and in the freezer. Should be a good time for everyone. So we’ve seen the peas when they first started sprouting. The looked like this last week. Last night, they looked like this. I sowed more peas of a different variety last night after we returned from a brisk walk in the cool weather. Everything else is popping up and thriving. The zucchini is moving right along. Cilantro is growing out of its starter pot and will need to be transplanted next week. Most of the tomatoes have been transplanted, with just the big boys to be done. The leeks are now on the outside of the row with the collards and broccoli, both of which are growing like (if you’ll pardon the expression) weeds. The sky is a clear and piercing blue as we make our way into evening. The weather has turned cooler now, giving rise to thoughts of having a fire going tonight while football plays on the tv and Boots curls up against my leg, dreaming whatever it is that cats dream when they really go to sleep. And I keep watch over my plants, patiently awaiting the first flower that is the omen of the bounty to come. But before that, I wanted to mention something we saw last weeked. It was an absolutely stunning fall day, cool without being cold, bright blue raining down from the sky. It was also the weekend of the air show, with the Blue Angels performing. We didn’t see any of that, but we did see this. I couldn’t get the entire image in one shot, so merged two shots after flipping them vertically and horizontally. 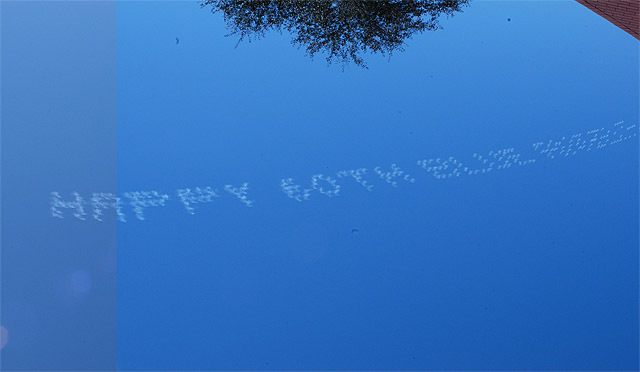 If you can’t read it, it says Happy 60th Blue Angels. Very nice, and stayed up for quite awhile as there was not much wind. Last night was a bit cool, so we had a fire crackling. The little one appreciated it. Today, in addition to doing my regular work stuff, I got my hands dirty. Transplanted the zucchini, which was erupting out of the peat pots and threatening to take over the warmer. I also started some catnip for the kitties, stevia, cilantro, and spearmint. The dill has sprouted and is well on its way to a lovely bouqet. What else has sprouted? Those sugar snap peas we sowed not terribly long ago. I’ll be digging up another small section for another variety of peas (real peas, the kind that most people get out of a can). I started some carrots (little finger), and we’ll see how those do. Next weekend it will be time to thin and space the lettuce, put up some twine for the peas to climb, and transplant the tomatoes and leeks. And maybe – just maybe – some of these will be ready next weekend as well. I don’t know why some people wear their stupid hats some days. It really doesn’t accessorize well.